Synthetic peptide corresponding to Human 14-3-3 sigma/SFN aa 69-81 (internal sequence). Our Abpromise guarantee covers the use of ab54420 in the following tested applications. IHC-P: 1/1000. Heat pre-treatment required. Is unsuitable for IHC-Fr or WB. Adapter protein implicated in the regulation of a large spectrum of both general and specialized signaling pathways. Binds to a large number of partners, usually by recognition of a phosphoserine or phosphothreonine motif. Binding generally results in the modulation of the activity of the binding partner. When bound to KRT17, regulates protein synthesis and epithelial cell growth by stimulating Akt/mTOR pathway. May also regulate MDM2 autoubiquitination and degradation and thereby activate p53/TP53. p53-regulated inhibitor of G2/M progression. 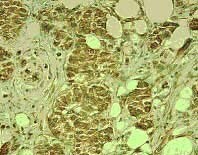 Present mainly in tissues enriched in stratified squamous keratinizing epithelium. Ubiquitinated. Ubiquitination by RFFL induces proteasomal degradation and indirectly regulates p53/TP53 activation. Cytoplasm. Nucleus. Secreted. May be secreted by a non-classical secretory pathway. ab54220, at 1/1000 dilution, staining Human 14-3-3 sigma/SFN in breast carcinoma tissue. Paraffin embedded sections. Detection using DAB with methyl green counterstain. Publishing research using ab54420? Please let us know so that we can cite the reference in this datasheet. There are currently no Customer reviews or Questions for ab54420.